Are you looking for the best ETFs to invest in 2018? Best performing ETFs, or perhaps best ETFs from the most popular fund issuers, such as Blackrock (iShares), Vanguard or State Street (SPDR)? Also, good ideas for ETFs from various segments or categories (such as U.S. equity, developed and emerging markets ETFs or fixed income ETFs)? If so, you’re at the right place. 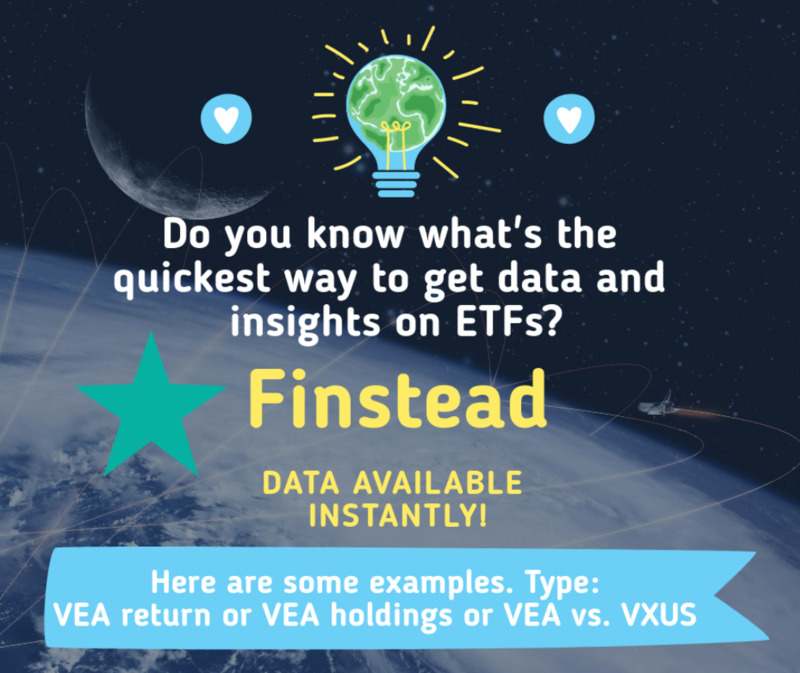 In this Finstead Insights post, we’ll provide some good choices for investing in ETFs. Our analysis is current as of May 2018, and here you’ll find some good ideas for investing in U.S. and international equity, large-, medium- and small-cap, fixed income, specialty (technology, healthcare, financial services, energy, and real estate) and commodity ETFs. But first of all, let us agree on the definition of ‘best ETFs’. For us, those are funds that are popular among investors, demonstrated by assets under management north of $1 Billion, above-average returns (in their respective categories), and low expense ratios (typically below 0.5%). We won’t compare ETFs from different segments, e.g., U.S. large-cap and emerging markets ETFs. The various segments should be treated separately because they represent different underlying themes. But within a specific ETF segment, we’ll provide our top choices. Since we’re not associated with any fund issuers, our perspective is relatively unbiased compared to what you may find elsewhere in the press. If you’re a firm believer in Vanguard ETFs, feel free to scroll down to view relevant Vanguard ETFs. So let’s get started. First, we're going to look at U.S. total market ETFs. Those are ETFs that represent the entire investable U.S. equity market. There are two funds that stood out from the rest based on our analysis. VTI is a U.S. - Total Market ETF. VTI underlying index is CRSP US Total Market Index. VTI expense ratio is 0.04%. 3-year annualized return is 10.20%. 5-year annualized return is 12.77%. VIG is a U.S- Total Market ETF. The Fund seeks to track the performance of the Dividend Achievers Select Index that measures the investment return of common stocks of companies that have a record of increasing dividends over time. VIG underlying index is NASDAQ US Dividend Achievers Select Index. VIG expense ratio is 0.08%. 3-year annualized return is 9.93%. 5-year annualized return is 10.73%. Now let's take a look at U.S. large-cap ETFs covering American stocks. The term large-cap refers to a company with a market capitalization above $10 billion. Large-cap ETFs have stocks of large-cap companies as their holdings. Large-cap ETFs are most commonly associated with the following indexes: S&P 500, Dow Jones, Nasdaq 100, and Russell 1000. The stocks within an ETF can be market-cap weighted or they could be equal weight. Most of the ETFs mentioned below are 'vanilla' large-cap ETFs; however, some focus on growth, while others focus on value. SPY is a U.S. Large-Cap ETF. SPY underlying index is S&P 500. SPY expense ratio is 0.09%. 3-year annualized return is 10.47%. 5-year annualized return is 12.86%. IVV is a U.S. Large-Cap ETF. IVV underlying index is S&P 500. IVV expense ratio is 0.04%. 3-year annualized return is 10.53%. 5-year annualized return is 12.93%. VOO is a U.S. Large-Cap ETF. VOO underlying index is S&P 500. VOO expense ratio is 0.04%. The Fund seeks to track the performance of its benchmark index, the S&P 500. The Fund employs an indexing investment approach. The Fund attempts to replicate the target index by investing all of its assets in the stocks that make up the Index with the same approximate weightings as the Index. 5-year annualized return is 12.92%. QQQ is a U.S. Large-Cap ETF. QQQ underlying index is NASDAQ-100 Index. QQQ expense ratio is 0.2%. The Fund seeks to provide investment results that generally correspond to the price and yield performance of the component securities of the Nasdaq-100 Index. 3-year annualized return is N/A. 5-year annualized return is N/A. IWD is a U.S. Large-Cap Value ETF. IWD underlying index is Russell 1000 Value Index. IWD expense ratio is 0.2%. The Fund seeks investment results that correspond generally to the price and yield performance, before fees and expenses, of the Russell 1000 Value Index. Uses a replication strategy. The Index measures the performance of those Russell 1000 Index firms with lower price-to-book ratios and lower forecasted growth. 3-year annualized return is 7.50%. 5-year annualized return is 10.33%. IWF is a U.S. Large-Cap Growth ETF. IWF underlying index is Russell 1000 Growth Index. IWF expense ratio is 0.2%. The Fund seeks investment returns that correspond generally to the price and yield performance, before fees and expenses, of the Index. Uses a replication strategy. The Index measures the performance of the large-capitalization growth sector of the US equity market. 3-year annualized return is 12.62%. 5-year annualized return is 14.93%. VTV is a U.S. Large-Cap Value ETF. VTV underlying index is CRSP US Large Cap Value Index. VTV expense ratio is 0.06%. The Fund seeks to track the performance of a benchmark index that measures the investment return of large-capitalization value stocks. The Fund employs a "passive management"-- or indexing --investment approach designed to track the performance of the CRSP US Large Cap Value Index. 3-year annualized return is 9.68%. 5-year annualized return is 11.85%. VUG is a U.S. Large-Cap Growth ETF. VUG underlying index is CRSP US Large Cap Growth Index. VUG expense ratio is 0.06%. The Fund seeks to track the performance of a benchmark index that measures the investment return of large-capitalization growth stocks. The Fund employs a "passive management"--or indexing--investment approach designed to track the performance of the MSCI US Prime Market Growth Index. 3-year annualized return is 11.20%. 5-year annualized return is 14.02%. IWB is a U.S. Large-Cap ETF. IWB underlying index is Russell 1000 Index. IWB expense ratio is 0.15%. The Fund seeks investment results that correspond generally to the price and yield performance, before fees and expenses, of the Russell 1000 Index. Uses a replication strategy to try to track the Index, which includes approximately 80% of the market capitalization of all publicly traded US equity securities. 3-year annualized return is 10.10%. 5-year annualized return is 12.70%. IVW is a U.S Large-Cap Growth ETF. IVW underlying index is S&P 500 Growth Index. IVW expense ratio is 0.18%. 3-year annualized return is 12.38%. 5-year annualized return is 14.78%. DIA is a U.S Large-Cap ETF. DIA underlying index is Dow Jones Industrial Average. DIA expense ratio is 0.17%. 3-year annualized return is 13.28%. 5-year annualized return is 12.82%. RSP is a U.S Large-Cap ETF. RSP underlying index is S&P 500 Equal Weight Index. RSP expense ratio is 0.2%. 3-year annualized return is 8.70%. 5-year annualized return is 12.17%. Now let's take a look at U.S. mid-cap ETFs covering American stocks. The term mid-cap refers to a company with a market capitalization between $2 billion and $10 billion. Mid-cap ETFs have stocks of mid-cap companies as their holdings. As the name implies, a mid-cap company falls in the middle of the pack between large-cap and small-cap companies. IJH is a U.S. Mid-Cap ETF. IJH underlying index is S&P MidCap 400 Index. IJH expense ratio is 0.07%. IJH description: The Fund seeks investment results that correspond generally to the price and yield performance, before fees and expenses, of the S&P MidCap 400 Index. The Index measures the performance of the mid-capitalization sector of the US equity market. Uses a representative sampling strategy to try to track the Index. 3-year annualized return is 9.31%. 5-year annualized return is 11.69%. VO is a U.S. Mid-Cap ETF. VO underlying index is CRSP US Mid Cap Index. VO expense ratio is 0.06%. 3-year annualized return is 7.97%. 5-year annualized return is 11.84%. MDY is a U.S. Mid-Cap ETF. MDY underlying index is S&P MidCap 400 Index. MDY expense ratio is 0.24%. The Trust seeks to invest results that, before expenses, generally correspond to the price and yield performance of the component common stocks of the S&P MidCap 400 Index. 3-year annualized return is 9.07%. 5-year annualized return is 11.45%. IWR is a U.S. Mid-Cap ETF. IWR underlying index is Russell Midcap Index. IWR expense ratio is 0.2%. 3-year annualized return is 8.10%. 5-year annualized return is 11.58%. Now let's take a look at U.S. small-cap ETFs covering American stocks. The term small-cap refers to a company with a market capitalization below $2 billion. Small-cap ETFs have stocks of small-cap companies as their holdings. As the name implies, a small-cap company falls below large-cap and mid-cap companies. IWM is a U.S. Small-Cap ETF. IWM underlying index is Russell 2000 Index. IWM expense ratio is 0.2%. 3-year annualized return is 9.71%. 5-year annualized return is 11.80%. IJR is a U.S. Small-Cap ETF. IJR underlying index is S&P SmallCap 600 Index. IJR expense ratio is 0.07%. The Fund seeks investment results that correspond generally to the price and yield performance, before fees and expenses, of the S&P SmallCap 600 Index. The Fund uses a replication strategy to try to track the Index, which includes approximately 2.5% of the market capitalization of the US equity market. 3-year annualized return is 12.01%. 5-year annualized return is 13.83%. VB is a U.S. Small-Cap ETF. VB underlying index is CRSP US Small Cap Index. VB expense ratio is 0.06%. VB description: The Fund seeks to track the performance of a benchmark index that measures the investment return of small-capitalization stocks. The Fund employs an indexing investment approach designed to track the performance of the CRSP US Small Cap Index, a broadly diversified index of stocks of small U.S. companies. 3-year annualized return is 8.81%. 5-year annualized return is 11.70%. VBR is a U.S. Small- Cap Value ETF. VBR underlying index is CRSP US Small Cap Value Index. VBR expense ratio is 0.07%. The Fund seeks to track the performance of a benchmark index that measures the investment return of small-capitalization value stocks. The Fund employs a "passive management" approach designed to track the performance of the MSCI U.S. Small Cap Value Index. 3-year annualized return is 8.56%. 5-year annualized return is 11.76%. A high dividend yield ETF is an exchange-traded fund that seeks to provide high yields by investing in high-dividend-paying common stocks or REITs. There are dividend ETFs that contain only U.S. domestic stocks and global dividend ETFs with an international focus. Below are the top three high dividend yield ETFs by assets under management. VYM is a U.S. High Dividend Yield ETF. VYM underlying index is FTSE High Dividend Yield Index Net TR US RIC. VYM expense ratio is 0.08%. The Fund seeks to track the performance of a benchmark index that measures the investment return of common stocks of companies that are characterized by high dividend yield. 3-year annualized return is 9.29%. 5-year annualized return is 11.24%. DVY is a U.S. High Dividend Yield ETF. DVY underlying index is Dow Jones U.S. Select Dividend. DVY expense ratio is 0.39%. The Fund seeks investment results that correspond to the price and yield performance, before fees and expenses, of the Dow Jones Select Dividend Index by using a replication strategy. SDY is a U.S. High Dividend Yield ETF. SDY underlying index is S&P High Yield Dividend Aristocrats Index. SDY expense ratio is 0.35%. Global ex-U.S. ETFs cover stocks of companies outside the U.S., including both developed and emerging markets. The top ETF (measured by assets) in the global ex-U.S. segment is VEU (see below). VEU is a Global Ex-U.S. Total Market ETF. VEU underlying index is FTSE All-World ex-U.S. Net TR US RIC. VEU expense ratio is 0.11%. The Fund seeks to track the performance of a benchmark index that measures the investment return of stocks of companies located in developed and emerging markets around the world. The Fund employs a "passive management" designed to track the performance of the FTSE/(R)/ All-World ex USA Index. 3-year annualized return is 5.29%. 5-year annualized return is 5.68%. Developed markets are countries that are most developed in terms of their economy and capital markets. The countries must be high income, but this also open to foreign ownership, easy to move capital and efficient when it comes to market institutions. The top 3 developed markets ETFs by assets under management are listed below. EFA is a Developed Markets Ex-U.S. - Total Market ETF. EFA underlying index is MSCI EAFE Index. EFA expense ratio is 0.32%. The Fund seeks to provide investment results that correspond generally to the price and yield performance of publicly traded securities in the European, Australasian and Far Eastern markets, as measured by the Index. The Index has been developed by MSCI as an equity benchmark for its international stock performance. 3-year annualized return is 4.94%. 5-year annualized return is 5.72%. VEA is a Developed Markets Ex-U.S. - Total Market ETF. VEA underlying index is FTSE Developed All Cap ex US Index Net TR US RIC. VEA expense ratio is 0.07%. 3-year annualized return is 5.72%. 5-year annualized return is 6.33%. IEFA is a Developed Markets Ex-U.S. - Total Market ETF. IEFA underlying index is MSCI EAFE Investable Market Index. IEFA expense ratio is 0.08%. 3-year annualized return is 6.00%. 5-year annualized return is 6.53%. An emerging markets ETF is an exchange-traded fund that focuses on the stocks of emerging market economies, such as Latin America, Asia, and Eastern Europe. The three emerging market funds below stood out from the rest because they attracted the largest amount of assets under management. VWO is an Emerging Markets - Total Market ETF. VWO underlying index is FTSE Emerging Markets All Cap China A Inclusion Index Net TR US RIC. VWO expense ratio is 0.14%. 3-year annualized return is 4.06%. 5-year annualized return is 3.64%. EEM is a Emerging Markets - Total Market ETF. EEM underlying index is MSCI Emerging Markets Index. EEM expense ratio is 0.69%. 3-year annualized return is 5.19%. 5-year annualized return is 3.78%. IEMG is an Emerging Markets - Total Market ETF. IEMG underlying index is MSCI Emerging Markets Investable Market Index. IEMG expense ratio is 0.14%. 3-year annualized return is 5.58%. 5-year annualized return is 4.31%. The top ETF (measured by assets) representing the Japanese market is EWJ (see below). EWJ is a Japan - Total Market ETF. EWJ underlying index is MSCI Japan Index. EWJ expense ratio is 0.49%. 3-year annualized return is 7.23%. 5-year annualized return is 6.79%. Fixed income ETFs are a type of exchange-traded funds that exclusively invest in bonds. They hold a portfolio of bonds with different strategies, from U.S. Treasuries to high yields, and holding periods, between long-term and short-term. AGG is a U.S. - Broad Market Investment Grade ETF. AGG underlying index is Bloomberg Barclays U.S. Aggregate Bond Index. AGG expense ratio is 0.05%. 3-year annualized return is 0.92%. 5-year annualized return is 1.36%. LQD is a U.S. - Corporate Investment Grade ETF. LQD underlying index is Markit iBoxx $ Liquid Investment Grade Index. LQD expense ratio is 0.15%. The Fund seeks investment results that correspond generally to the price and yield performance of a segment of the U.S. investment grade corporate bond market as defined by the GS $ InvesTop Index. 3-year annualized return is 1.95%. 5-year annualized return is 2.24%. BND is a U.S. - Broad Market Investment Grade ETF. BND underlying index is Bloomberg Barclays U.S. Aggregate Float Adjusted Index. BND expense ratio is 0.05%. 3-year annualized return is 0.94%. 5-year annualized return is 1.34%. TIP is a U.S. Government TIPS ETF. TIP underlying index is Bloomberg Barclays U.S. Treasury Inflation Protected Securities (TIPS) Index (Series-L). TIP expense ratio is 0.2%. The Fund seeks to replicate the Barclays Capital U.S. Treasury Inflation Notes Index. In order to achieve its objective, the fund will us a passive indexing approach. 3-year annualized return is 0.87%. 5-year annualized return is -0.27%. BSV is a Government/Credit Investment Grade Short-Term ETF. BSV underlying index is Bloomberg Barclays U.S. 1-5 Year Government/Credit Float Adjusted Index. BSV expense ratio is 0.07%. The Vanguard Short-Term Bond ETF tracks a market-weighted index of US-government bonds, investment-grade corporate and investment-grade international dollar-denominated bonds with maturities of 1-5 years. 3-year annualized return is 0.60%. 5-year annualized return is 0.74%. VCSH is a Corporate Investment Grade Short-Term ETF. VCSH underlying index is Bloomberg Barclays U.S. 1-5 Year Corporate Bond Index. VCSH expense ratio is 0.07%. The Fund seeks to track the performance of a market-weighted corporate bond index with a short-term dollar-weighted average maturity. The Fund employs a "passive management" - or indexing - investment approach designed to track the performance of the Barclays Capital U.S. 1-5 Year Corporate Bond Index. 3-year annualized return is 1.35%. 5-year annualized return is 1.48%. HYG is a U.S. - Corporate High Yield ETF. HYG underlying index is Markit iBoxx $ Liquid High Yield Index. HYG expense ratio is 0.49%. The Fund seeks investment results that correspond generally to the price and yield performance of the U.S. dollar high yield corporate bond market as defined by the iBoxx $ Liquid High Yield Index. The Fund will invest at least 90% of its assets in component securities of its Underlying Index. 3-year annualized return is 3.36%. 5-year annualized return is 3.25%. PFF is a U.S. - Corporate Preferred Stock ETF. PFF underlying index is S&P U.S. Preferred Stock Index. PFF expense ratio is 0.47%. 3-year annualized return is 3.25%. 5-year annualized return is 4.15%. VCIT is a U.S. - Corporate Investment Grade Intermediate ETF. VCIT underlying index is Bloomberg Barclays U.S. 5-10 Year Corporate Bond Index. VCIT expense ratio is 0.07%. The Fund seeks to track the performance of a market-weighted corporate bond index with an intermediate-term dollar-weighted average maturity. The Fund employs a "passive management - or indexing - investment approach designed to track the performance of the Barclays Capital U.S. 5-10 Year Corporate Bond Index. 3-year annualized return is 1.79%. 5-year annualized return is 2.20%. BIV is a Government/Credit Investment Grade Intermediate ETF. BIV underlying index is Bloomberg Barclays U.S. 5-10 Year Government/Credit Float Adjusted Index. BIV expense ratio is 0.07%. The Fund seeks to track the performance of a market-weighted bond index with an intermediate-term dollar-weighted average maturity. The Fund employs an indexing investment approach designed to track the performance of the Barclays U.S. 5-10 Year Government/Credit Float Adjusted Index. 3-year annualized return is 0.84%. 5-year annualized return is 1.25%. The top ETF (measured by assets) in the financials segment is XLF (see below). XLF is a U.S. Financials ETF. XLF underlying index is S&P Financial Select Sector Index. XLF expense ratio is 0.13%. 3-year annualized return is 13.99%. 5-year annualized return is 14.59%. The top two ETFs (measured by assets) in the technology segment are XLK and VGT (see below). XLK is a U.S. Technology ETF. XLK underlying index is S&P Technology Select Sector Index. XLK expense ratio is 0.13%. 3-year annualized return is 17.39%. 5-year annualized return is 18.35%. VGT is a U.S. Technology ETF. VGT underlying index is MSCI US Investable Market Information Technology 25/50 Index. VGT expense ratio is 0.1%. The Fund seeks to track the performance of a benchmark index that measures the investment return of information technology stocks. 3-year annualized return is 18.16%. 5-year annualized return is 19.94%. The top ETF (measured by assets) in the healthcare segment is XLV (see below). XLV is a Precious Metals Silver ETF. XLV underlying index is N/A. XLV expense ratio is 0.13%. 3-year annualized return is 6.30%. 5-year annualized return is 13.40%. The top ETF (measured by assets) in the energy segment is XLE (see below). XLE underlying index is S&P Energy Select Sector Index. XLE expense ratio is 0.13%. 3-year annualized return is -0.85%. 5-year annualized return is 1.42%. The top ETF (measured by assets) in the real estate segment is VNQ (see below). VNQ underlying index is MSCI US REIT Index. VNQ expense ratio is 0.12%. The Fund seeks to provide a high level of income and moderate long-term capital appreciation. The Fund employs an indexing investment approach designed to track the performance of the MSCI US REIT Index. The Index is composed of stocks of publicly traded equity real estate investment trusts (known as REITs). 3-year annualized return is 3.09%. 5-year annualized return is 4.56%. The top ETF (measured by assets) in the commodity segment is GLD (see below). GLD is a Precious Metals Gold ETF. GLD underlying index is Gold Spot. GLD expense ratio is 0.4%. The Fund seeks to achieve the performance of gold bullion less the expenses of the Fund. The Fund is designed as a cost-effective way for investors to access the gold bullion market. 3-year annualized return is 2.45%. 5-year annualized return is 0.89%. We hope you found our choice of the top ETFs for 2018 informative and helpful. Note that these funds are suggested to you because of their relative popularity (demonstrated by total asset value), solid performance within their categories and low expense ratios. And remember there is no guarantee that these funds will continue to perform well in the future. If you have any questions or comments, send us an email at: hi [at] finstead [dot] com.